SK Hynix announces world's first 128GB DDR4 memory module. The stick utilizes 8Gb DDR4 memory chip made on a 20nm-class process, it has a 2133MHz frequency and runs at 1.2V. SK Hynix Inc. (or ‘the Company’, www.skhynix.com) announced that it has developed the world’s first highest density of 128GB(Gigabytes) module based on 8Gb(Gigabit) DDR4 using its advanced 20nm class technology. This module has double density compared to existing 64GB by taking advantage of TSV(Through Silicon Via) technology. This new product works at 2133Mbps and with a 64-bit I/O it processes up to 17GB of data per second. It also runs at ultra low-voltage of 1.2V which does at lower voltage than 1.35V of existing DDR3. SK Hynix is expected to continuously maintain its technology leadership in the server DRAM market by providing the samples of the world’s first 128GB and 64GB modules built on 8Gb DDR4. The Company plans to start volume mass production of those from the first half of next year. 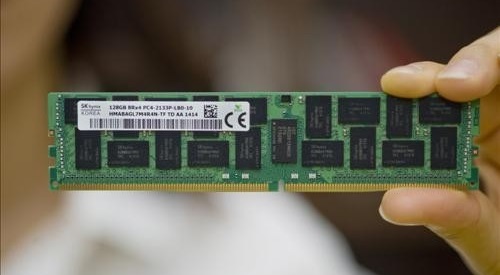 “The development of the world’s first 128GB DDR4 module has its significance in opening ultrahigh density server market” said Senior Vice President Sung Joo Hong, the Head of DRAM Development. “The Company will further strengthen its competitiveness in premium DRAM sphere with the development of high density, ultrahigh speed and low power consuming products” he added. According to Gartner, server DRAM market will grow 37% in annual average until 2018 following expansion of mobile environment. Plus, the new interface DDR4 is expected to be certified by customers in this year and is anticipated to be commercialized regularly from 2015. Also, it is expected to be the main standard in the industry from 2016.